Star formation studies in the last decades have usually concentrated on inner Galactic regions in the first and fourth quadrants. However, our knowledge about star formation in the outer Galaxy is so far only scarcely constrained. The arrival of the Planck cold clump catalog now offers a unique sample of outer Galaxy regions to set into context with the previously studied regions further inside our Milky Way. 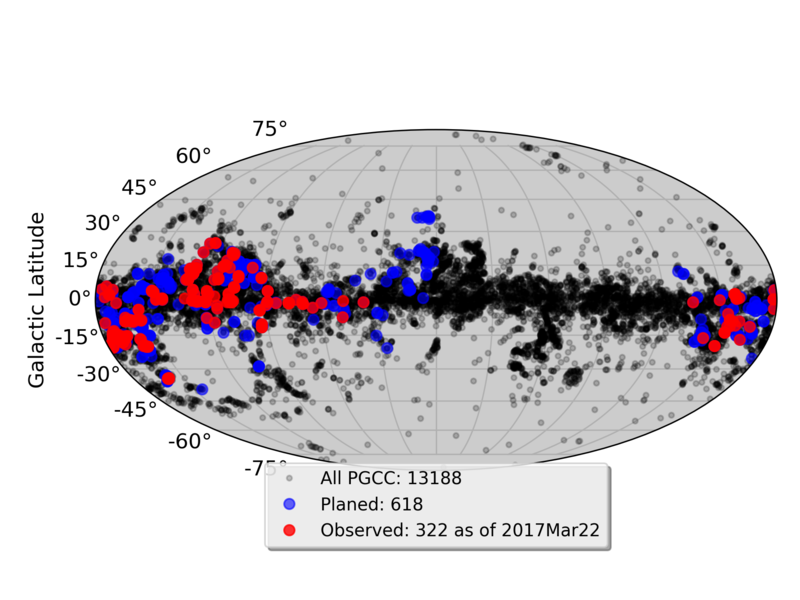 SAMPLING is an ongoing ESO Public Survey that will obtain 12CO and 13CO (2-1) maps toward 600+ PGCC sources, using the SMT 10m telescope of the Arizona Radio Observatory. Combined with existing Herschel and Planck data sets, we will resolve the clump structure, derive the internal variations of density, turbulent and chemical properties, and also make a connection to Galactic structure. This survey will provide the first major step forward to characterize molecular clouds and star formation on truly Galactic scales. SAMPLING has been awarded 718 hours of observing time at the SMT for the first three years. The observations started in November 2015. Progress is updated after each observing run, in the above figure. Note: the 2017-2018 observations are finished, to be updated in the figure. A list of SAMPLING Publications. Page generated by GitHub Pages using the Cayman theme. Maintained by Ke Wang (@esoPanda).